Harvesting Rainwater. Backyard rainwater collecting information. Every little drop counts. Rainwater capture systems store rainwater... for when it isn't raining. Harvesting Rainwater is easy and inexpensive - and your gardens will love it. 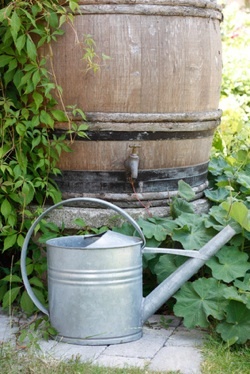 Savvy gardeners use rainwater capture and storage methods to keep gardens lush and productive. How to get your rain water harvest system underway. For successful rainwater capture you need a roof and a rain barrel... and rain. Back yard rainwater collecting has a positive effect on your gardens and trees, they just like rainwater better. More than that, using rainwater to water plants, trees and gardens can save you up to half of your water expense in the summers. That's a big deal! Water is a precious resource so why let nourishing rainwater run off your property, taking good topsoil with it? Here you'll find tips for successful rain water collection, a video on setting up your own rainwater storage system and links to great rainwater capture resources. Going Green at Home highly recommends annual testing of your rainwater runoff to ensure the safety of your water supply, especially if it will be consumed by humans or animals. In most places, rainwater must be aggressively filtered before humans consume it and even then it sometimes requires boiling and/or the addition of chlorine or other purifying methods, to rid it of unwanted micro organisms. Naturally, where you live will have an impact on the quality of your rainwater. Our recommendation is that you use unfiltered rainwater only for purposes other than drinking. Watering plants and trees, laundry, outdoor shower, rinsing off boots and garden implements, washing the car, washing solar panels... that sort of thing. Guidelines for Harvesting Rainwater From Your Roof. It's important to have a gutter system in place before beginning your rainwater harvest project. Choose a level spot in an out of the way area where you can easily direct your roof spill. The roof of a house is commonly used but you can use garage, barn and other building roofs for rainwater collecting. Most people want the tank to be out of sight and some counties mandate it. If you are unable to hide the tank... disguise it, with plantings, trellises, pots, trees or shrubs. Establish your rain barrel in an elevated area near the place where you'll be using the water to make use of the gravity flow for watering with a hose. A rain chain does more than add ambience. Aside from being a lovely focal point the rain chain directs the water to exactly where you want it. Guide the rain water into the rain barrel or other catchment tank or over rockery to prevent erosion of soil from runoff. When you install your empty rain barrel it'll be fairly lightweight. As the barrel begins collecting rainwater it will gain a significant amount of weight. A 45 gallon drum will weigh over 400 pounds when it's full of rainwater. Construct a level and stable base from cement, gravel, cinder block, brick or stout wood pieces for your collection barrel to sit on. Make the most of gravity, it's free energy and environmentally friendly. If you can, elevate your barrel to a level that allows the water inside to flow on it's own when the valve is opened. The higher (and fuller) the rain barrel is, the more water pressure you'll have. Avoid roofs painted with toxic paints, lead solder joints, palapa or sod roofs, oil based bitumen shingles and tar roof coverings. to be considering a new roof and want the best one for harvesting rainwater, a galvanized steel roof or epoxy painted metal are both good choices. Metal roofs are smooth which makes it easier for the rains to clean them and the rainwater runs easily off the roof into your barrel. Tile and slate are also good materials although more expensive and wood shakes work fine as long as they're untreated. Aluminum is so-so for rainwater harvesting, there have been concerns about the ingestion of aluminum from cooking utensils in the past, but it would take a very acidic rain to allow the aluminum to leach into the water. A water test will let you know if your roof runoff contains higher than acceptable levels of aluminum as well as numerous other chemicals and organisms. Asphalt, which covers the majority of roofs (or is it rooves? ), isn't a good choice for harvesting rainwater intended for drinking or bathing but no problem if you'll be using the water in your yard or garden. Old style concrete tiles sometimes contain asbestos. Health issues arising from asbestos are almost exclusively due to the inhalation of asbestos dust, an unlikely event in the case of rainwater collecting. The finer the filter the more micro organisms will be removed. Start with a mesh screen to filter debris such as leaves and bugs then something like a sand filter to capture smaller particulate. Continuously finer filters can be added depending on the end use of your rainwater. Water that is intended for drinking will need more stringent filtration than water intended for lawn and garden maintenance. Stable and secure installation to prevent tipping or falling of the rain barrel. Chemical free storage containers, roofing materials, gutters and drainage pipes. Particularly after a lengthy dry spell, allow the rain to wash the roof for at least 5 minutes in a downpour before you begin collecting rainwater. The highest concentration of chemical fallout, bird droppings and dead bugs will be in the first few minutes. The probability of serious contamination from the air is low in most cases and a 5 minute roof wash should prevent any undesireable roof dwelling materials from entering your rain water storage system. Soaker hoses require water that is very clean and under pressure. Gravity feed systems do not supply enough pressure to push water through the material of the hose. A pump will be necessary if you want to use a soaker hose. Heres' a "do it yourself" video to get you started harvesting rainwater on your property. Some municipalities and states/provinces are passing bylaws preventing the diversion of rainwater. Just because it falls on your property doesn't, apparently, mean that the rainwater belongs to you. Particularly in more arid regions, there are concerns that rainwater capture interferes with the municipal water supply. A supply that relies on rainwater capture in the storm drains. Check with local authorities before installing any rainwater collecting system on your property.